the tallest peak in the entire state of Wyoming. In addition to massive towering peaks, the Wind River Range, known locally as "The Winds", is also home to 7 of the 10 largest glaciers, including the largest glacier, in the U.S. Rocky Mountains. There are over 2,300 high mountain lakes and ponds found throughout this magnificent mountain range, as well as countless valleys, forests, meadows and cirques and mountain streams. 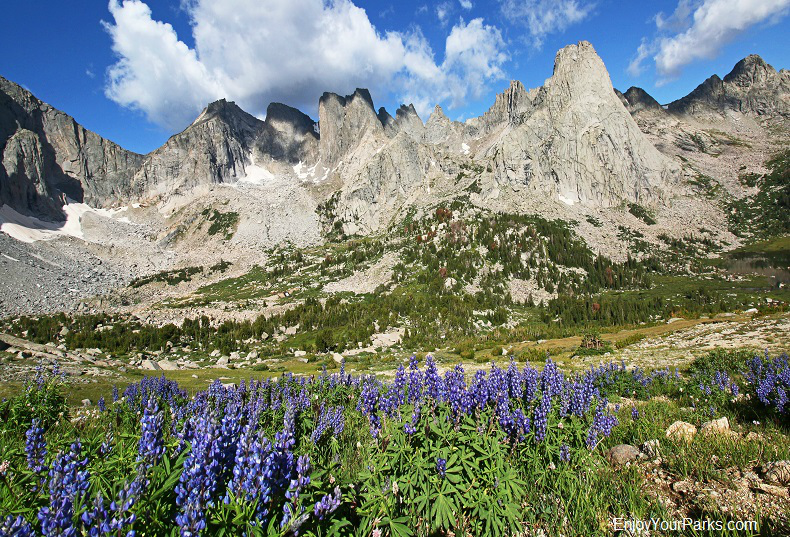 The Wind River Range covers an area of 2.25 million acres and is nearly 100 miles long... much of the range consisting of jagged granite peaks that are absolutely awe-inspiring. As part of the Bridger Wilderness Area and three other wilderness designations, as well as the Bridger-Teton National Forest and Shoshone National Forest of western Wyoming, the crest of the Wind River Range extends along the continental divide of western Wyoming. The great Wind River Mountain Range also serves as the headwaters of the magnificent Green River. 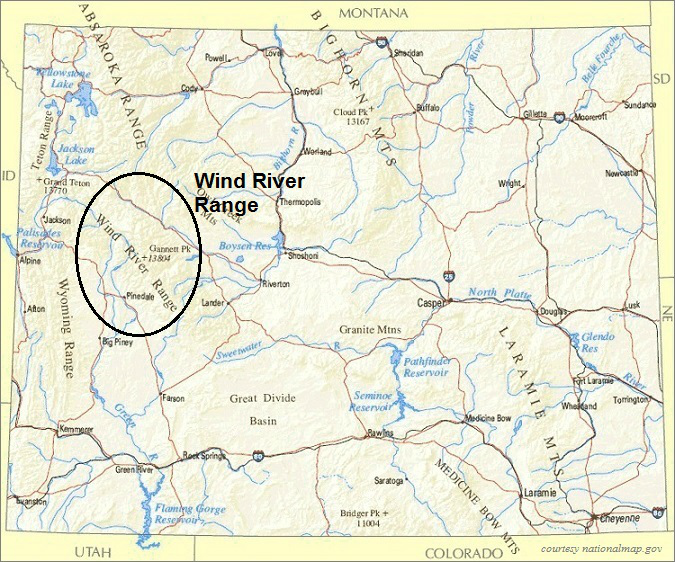 And a very unique feature of the Wind River Range is the location of a "triple divide", where water drains into three different water sheds: The Colorado River Drainage, the Columbia River Drainage and the Missouri River Drainage. The mountains of the Wind River Range are composed of solid granite, and have been carved to their present shape by many different ice ages, beginning about 500,000 years ago. There are 167 unnamed glaciers and 16 named glaciers in the Wind River Range, the largest being Gannett Glacier which rests on the north slope of Gannett Peak in the Fitzpatrick Wilderness. This massive alpine glacier also happens to be the largest glacier found in the Rocky Mountains of the lower 48 states. Of the 10 largest glaciers found in the Rocky Mountains, 7 of them reside in the Wind River Range. 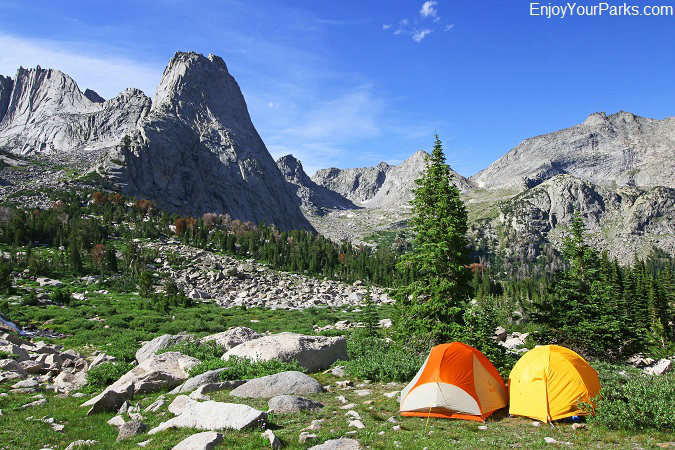 The Wind River Mountain Range is one of the most popular mountains for backpackers in North America. There are over 600 miles of hiking trails that give hikers access to seemingly limitless back country area. The scenic beauty of these magnificent mountains is jaw-dropping and stunning everywhere you look, and there is wildlife around every bend in the trail. 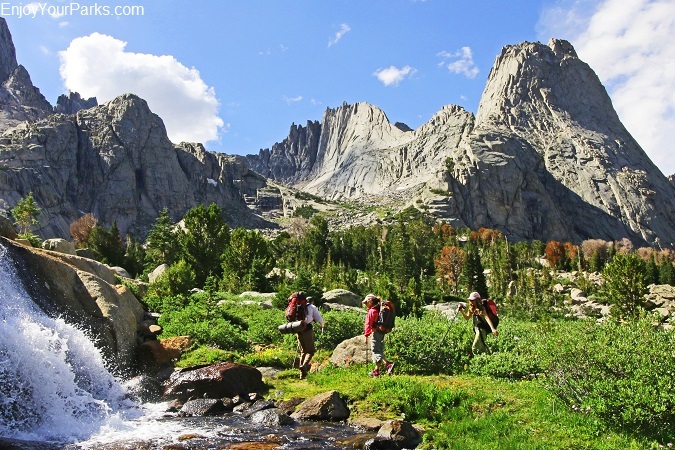 There is considered by many that the Wind River Mountain Range is the greatest mountain range in Wyoming, and if you enjoy hiking and overnight backpacking, you really need to experience these iconic mountains. 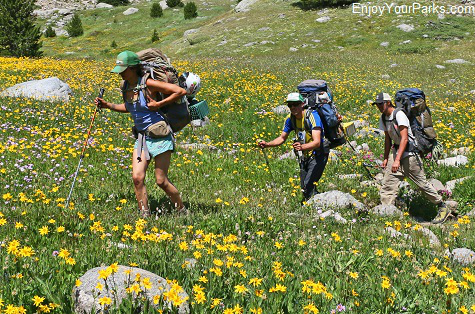 Backpackers enjoying the Wind River Mountain Range. The Continental Divide National Scenic Trail, or abbreviated CDNST, runs from Canada to Mexico along the continental divide. About 80 miles of this famous trail passes through the Wind River Range, between Big Sandy Opening and Green River Lakes, and reaches an elevation of over 11,000 feet before dropping into the Green River Lakes area. 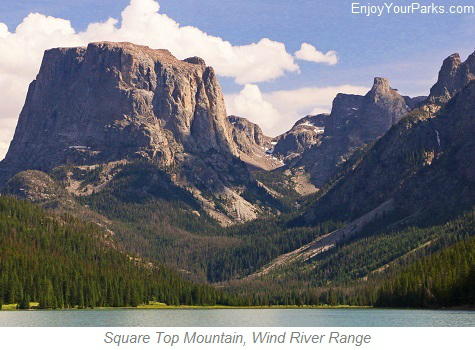 Cirque of the Towers, Wind River Mountain Range in Wyoming. 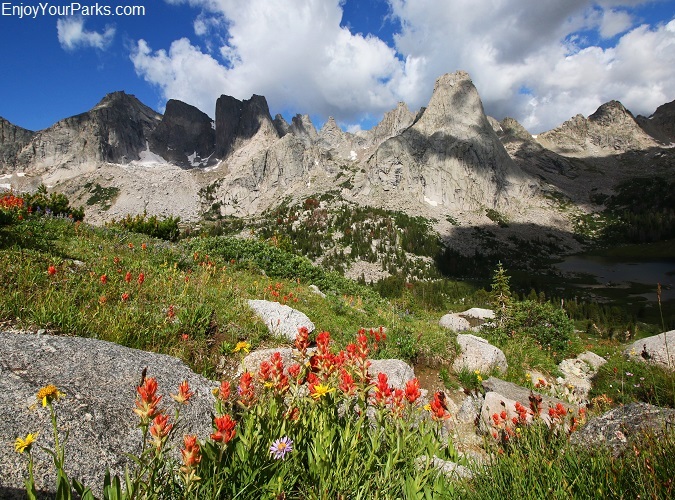 The Cirque of the Towers, which is located in the southern portion of the Wind River Range, is not only unbelievably scenic, but is also a very popular area for technical rock climbing and technical mountain climbing due to the many sheer granite peaks in this area. And throughout the Wind River Range are countless iconic peaks that are very popular mountain climbing destinations for those with the proper mountain climbing skills. It's an endless mountain climbing "playground". 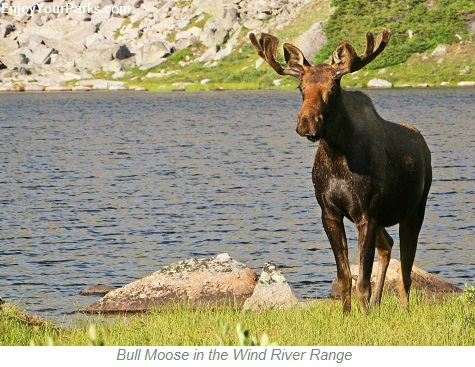 The Wind River Range is home to a large variety of wildlife, including elk, deer, pronghorn, black bears, grizzly bears, wolves, bighorn sheep, moose, wolverines and mountain lions just to name a few. 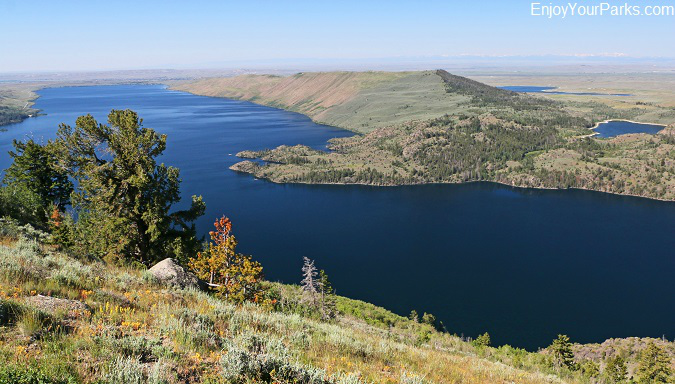 You will also see bald eagles, hawks and falcons soaring in the sky In the high mountain lakes there are a number of different fish species such as Cutthroat, Brook, Golden, Rainbow and Brown Trout, as well as Mackinaw and Grayling. So not only will hikers be able to enjoy some of the most spectacular alpine landscape in North America, but they will also have the opportunity to see amazing wildlife too! One of the thousands of alpine lakes in the Wind River Range. 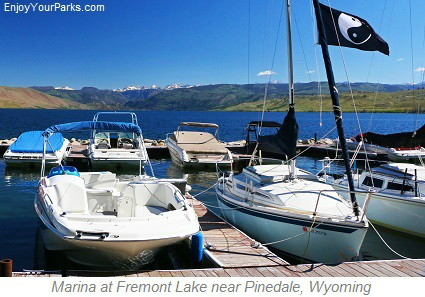 Located about 77 miles southeast of Jackson Wyoming rests the charming town of Pinedale Wyoming along U.S Highway 191. 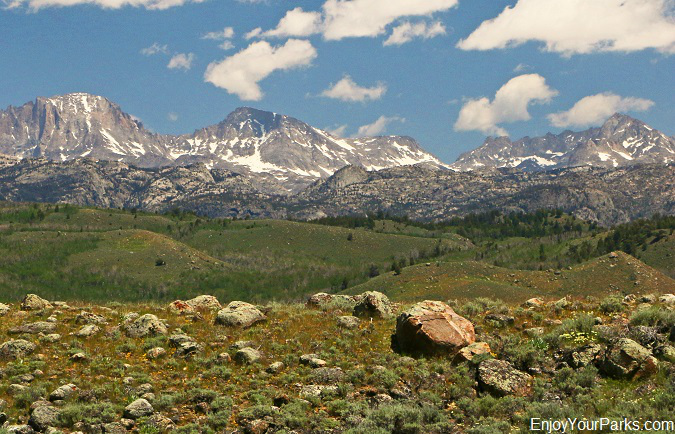 Known as "The Gateway To The Wind River Range", Pinedale Wyoming is where your Wind River Range adventure begins. 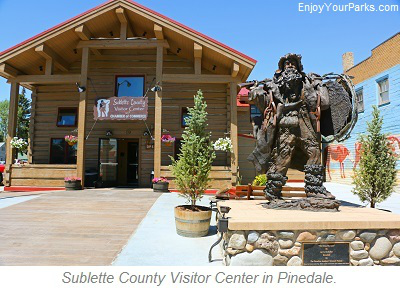 In addition to the many excellent restaurants, gift stores and places for lodging, Pinedale also offers its visitors a variety of other worthwhile attractions, such as the 80th Annual Green River Rendezvous, Path of the Pronghorn Wildlife Corridor, Green River Cattle Drive, Pinedale Aquatic Center, Pinedale Walking Tour, Sublette County Visitor Center, Lander Historical Park, Museum of the Mountain Man, National Geographic Photo Exhibit, Granite Hot Springs, Sommers Homestead Living History Museum and Green River Valley Museum. 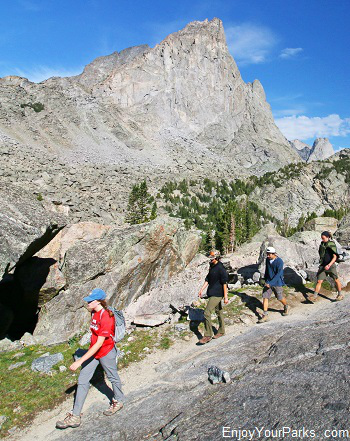 Pinedale Wyoming is also the home of ranger station headquarters that oversees the Wind River Range, and is where you will want to visit before embarking on your Wind River Hiking Adventure. 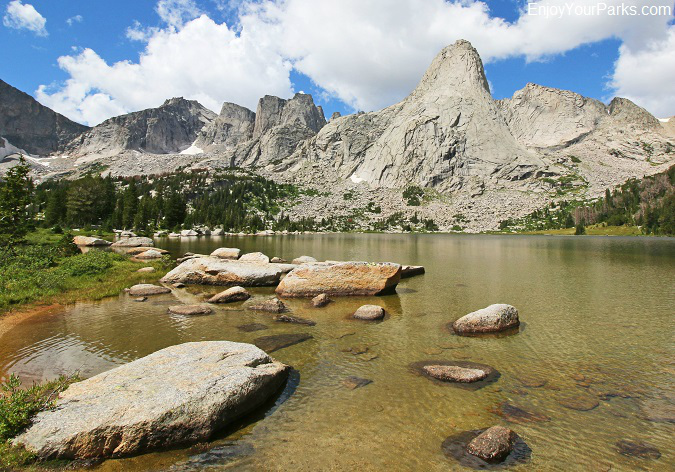 Fremont Lake is a popular outdoor recreation area near Pinedale Wyoming, which lies at the base of the Wind River Range. pristine... and mostly undeveloped lake that was naturally formed through glaciation. The water is extremely cold, even in the summer, but that doesn't stop water sport enthusiasts from enjoying it...especially boaters and fishermen. Fremont Lake is 12 miles long and about a half mile wide. 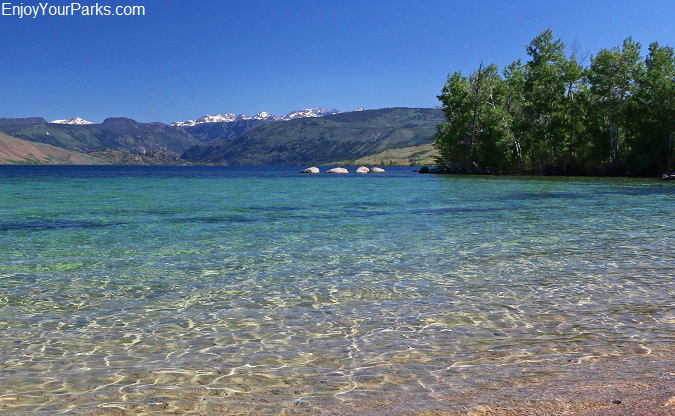 At 696 feet in depth, Fremont Lake is the 7th deepest lake in America. Fremont Lake is accessible by taking the paved road FS-111 out of Pinedale, and there is a boat dock accessible via this paved road. There are boat rentals, restaurant, marina and lodging located at the boat dock. Near this boat dock is Sandy Beach, which is ideal for launching canoes, kayaks and wind surf boards. There is a picnic area located in this vicinity as well. The frigid, dark blue waters of Fremont Lake provide outstanding habitat for brown trout, rainbow trout, lake trout and Kokanee salmon. There are several popular fishing derbies held throughout the year, with the most popular derby being the Big Fish Ice Derby. Boating is extremely popular at Fremont Lake, including sailing. In fact, every August the Sailing Regatta is held, which is a well attended annual event for sailing enthusiasts. In addition to sailing, motorized run-abouts are popular, as well as canoes, kayaks and wind surf boards. Fremont Lake near Pinedale Wyoming. Wind River Range from the Soda Lake Wildlife Habitat Management Area near Pinedale Wyoming.